I have a slightly oversized three car garage that I use as my wood shop. It came with three, four-foot, two-bulb, florescent light fixtures—one over each bay. It also came with three garage door openers, each with a low wattage, single bulb. When I turned on all the lights, it was not bad. However, I’m 52 and my eyes aren’t what they use to be. I don’t like to strain, and I like my work area to be bright. I bought five Metalux SLSTP LED Strip Shop Lights (#4SLSTP4040DD-120V) to replace the three florescent fixtures. They weren’t cheap at $66.53 a piece (Lowe’s military discount—Semper Fi!) but they had the specs I was looking for: 4200K, 80 CRI, 4000 lumens. They are listed as four feet long but their actual size is forty-seven inches long by two and one half inches wide. The actual size is listed on the consumer packaging and can be found on various websites—in short, the manufacturer wasn’t trying to be deceptive about shorting the customer an inch. Anyhow, I turned on the lights when I was done, and WOW was it bright. I have tools lining the walls and a large workbench in front of the middle garage door and I have no shadows to contend with when I work at any of the stations. I really had no idea how bad it was before with the old fixtures. The upgrade, although costly, truly was worth every penny. Thanks for the review, I am trying to decide between those same fixtures and two other options for adding some much needed light to my new space. I was taken back by the price so I am glad to hear some real world experience with them. I just installed three LED fixtures in my shop as well. I had the same reaction you did. MAN what an improvement. I purchased this fixture from Amazon for $39.99 each. 4500 lumens, dual strips in a standard four foot fixture, hangs with chain and has a pull chain. Each one pulls 40 watts. Instant on, even when the shop is cold. I have four of them in my shop now, and they are bright, bright, bright! $38.44 a pop. I totally agree that LED is the way to go. Plus you have no fears about overloading a circuit by putting a ton of lights on it, because they draw so little current. Never change a bulb… bright… energy efficient… only downside is the cost. The prices on fluorescent bulbs are rising as they are being “forced” out, especially for the old T12’s. T8’s and the T5’s will probably follow suit. Where you can really save if you already have a 4’ fixture, you can get the LED bulbs that are drop-in replacements for the fluorescent tubes. 2000 Lumens per bulb at 80CRI, 5000K, 18 watts is fairly standard for the cheap variety ($8 each). This means about $16 to upgrade an old 2-tube 4 footer to something that actually can light the floor. The prices on fluorescent bulbs are rising as they are being “forced” out, especially for the old T12 s. T8 s and the T5 s will probably follow suit. 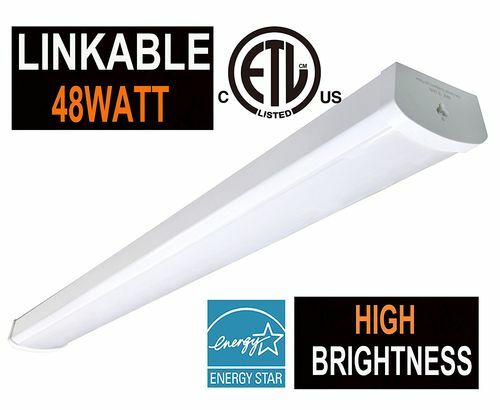 Where you can really save if you already have a 4 fixture, you can get the LED bulbs that are drop-in replacements for the fluorescent tubes. I was going to go this route but all my ballasts were 20+ years old and shot. They go for anywhere between $15-$20 so by the time you replace them and buy the bulbs you’re near the price of a new LED’s. So I decided to just junk the old fluorescent fixtures and go with LED. I chose the direct mount over the type that hangs on a chain because it sure looked like a perfect place for sawdust to accumulate! I was going to go this route but all my ballasts were 20+ years old and shot. They go for anywhere between $15-$20 so by the time you replace them and buy the bulbs you re near the price of a new LED s. So I decided to just junk the old fluorescent fixtures and go with LED. I chose the direct mount over the type that hangs on a chain because it sure looked like a perfect place for sawdust to accumulate! That’s one of the nice things about the LED drop-in tubes. You can simply put them in and they use the old ballasts for power (at a cost of about 5% in increased power usage), or you can remove the ballasts and wire them directly. Basically you just use the old fixture and sockets. Saves some cash and work, especially if your old fixtures are installed into the ceiling. That s one of the nice things about the LED drop-in tubes. You can simply put them in and they use the old ballasts for power (at a cost of about 5% in increased power usage), or you can remove the ballasts and wire them directly. Basically you just use the old fixture and sockets. I was going to do that on one of my fish tanks – until I read the fine print on the LED package, where they only work with full electronic ballasts. My old fish tank cover has one of those old spark-o-matic push in starters in it, so I believe it would not work in that situation. I have two tube 8 foot fluorescent fixtures in my shop and I started to convert them to LEDs. I got the 120v type where you rewire the fixture and delete the transformer. The work great but for one small problem. I like to listen to the radio in the shop and the LEDs put out so much RF signal the the radio has a strong humming noise. This is made worse because I’m in a rural area so the radio signals are not very strong to begin with. I contacted the Mfg and they suggested using ferrite filters but that helped but not completely. Back to flourescent for now.